Divination was an important part of pan-Celtic life. The Mediterranean accounts tell of extremely superstitious Celts studying the bloody, warm, still-pulsing entrails of human sacrifices [Tacitus, Strabo], but since both of those authors weren’t what we’d call objective, those accounts may well have been rather highly colored for their target audiences. The use of animal entrails is also controversial, and may not have been commonly practiced. Druids (Irish female Druids were called bandrui) and especially bards often employed divination, omens, prophecy, certain plants, and altered states of consciousness in order to predict the future. Before uttering their prophecies, the Druids would eat acorns, shut themselves away in a dark place, chant, and in other wise attempt to attain an “ecstatic” visionary state similar to that of the Siberian and SÃ¡mi shamans. Specialists performed the more elaborate forms of divination, but ordinary folks could on occasion say sooth, especially on Samhain (Novermber 1). This holiday marked the New Year to the Celts, and auguries were best performed on that day, just as in other cultures, auguries (mostly love, it seems) were performed on January 1. This holiday, according to the records, featured lots of booze. It was also the day upon which one slaughtered pigs. Fires were lit on certain hilltops, and the dead/faerie could walk upon earth, visible even to those who weren’t second-sighted. Maidens on the Isle of Man baked “dumb cake” (soddag valloo) directly on the coals on the hearth; this cake was then eaten in total silence by all the women of the household. Then the ladies retired to their beds, hopefully to dream of their intended lovers and husbands-to-be. If a girl filled her mouth with water and lurked just outside a neighbor’s house, holding salt in each hand, she would hear the name spoken of her future love. And ten Crows for the devils own self. 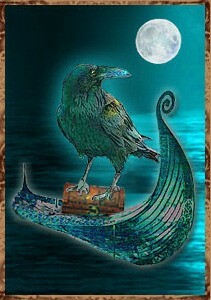 The crow, black-feathered and fond of carrion, was linked to the Morrigan, sort of a Celtic Valkyrie type “plied” goddess linked with fated death. They hovered over the dying [doubtless to get first crack at the best parts], and could also inform where the best site for building a new settlement or town should be located. It was considered bad luck to have a crow look down the chimney, for that meant that someone within the house was fated to die in the near future. Another belief was that the birds were faeries who shape-shifted to cause troubles. Magickal qualities included bringing knowledge, shape-shifting, eloquence, prophecy, boldness, skill, knowledge, cunning, trickery and thievery. In the Middle Ages, people believed that sorcerers and witches used the symbol of Crowâ€™s foot to cast death spells. The sad tale of Deirdre of the Sorrows is contained in a manuscript from the 9th century. There were disputes between the Kingdom of Ulster and Queen Maeve of Connacht and her allies. Fergus, who had been King of Ulster, supported Connacht rather than his native Ulster during the raid. Fergus had desired to marry his brother’s widow, Nessa. She would only agree if he allowed her son, Conchobar, to be King for one year. Deirdre was the daughter of the chief storyteller of Conchobar. The druid Cathbad, the new King’s chief advisor, predicted her great beauty and that many Ulster warriors would die because of her. The men of Ulster wanted to kill her but Conchobar hid her under the care of a nurse as he intended to marry her. One winter when she was old enough to marry, Deirdre saw a raven drinking the blood of a freshly slaughtered calf. “I could love a man with hair like the raven, cheeks like blood and skin like snow.” and her nurse told her there was such a man. His name was Naoise, son of Usna. Deirdre and Naoise met and eloped to Scotland with his two brothers. Conchobar was furious but dispatched an offer of peace. They agreed to all return if Fergus accompanied them for safety. Conchobar had Fergus delayed and them all murdered with the exception of Deirdre. Fergus’s son was travelling with them and he was also murdered. Fergus left Ulster and offered his services to Queen Maeve. Deirdre lived with Conchobar for a year but she never overcame her grief and killed herself by jumping from a chariot. In most of England, seeing a solitary crow meant anger, but in Northamptonshire, it meant ill fortune. Crow, cawing in a hoarse voice, meant bad weather. A death omen was a crow cawing thrice as it flew over a house. The Irish believed that Crow flocking in trees, but not nesting were souls from Purgatory. Finding a dead crow was a sign of good fortune. 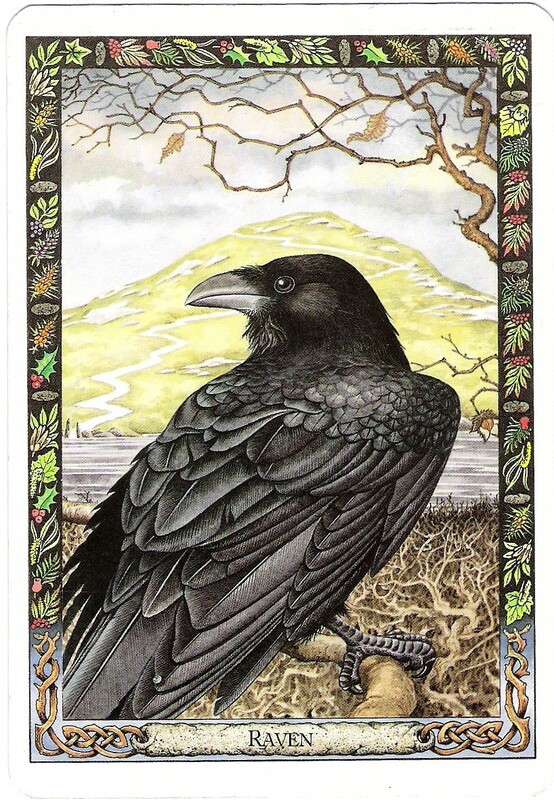 Russians believed that witches took the shape of Crow. As we may see, the practice of divining from bird calls, properly called auspicy in the English language, appears to actually originate in China. Yet, as narrowly concerned with crows, it would seem the practice is an Indo-Tibetan invention with symbiotic relationship to Chinese methods.Â Join us tomorrow for Part 3: Divination According to Tibet. 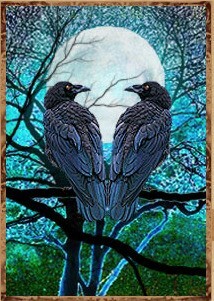 Visit the Raven Oracle for your own divination!